Annuity providers are prepared to offer more income if you have medical conditions as this is expected to reduce your life expectancy. Fewer years to pay out an annuity means they can give you more now, often between 20% to 40% extra income. Enhanced annuities apply to both a pension impaired health annuity and purchased life annuity. In general, individuals that qualify for impaired annuities have a significantly reduced life expectancy (usually less than 5 years to live). It could be that a family have an elderly relative now in a nursing home with a serious illness and they want to protect the estate from the high costs, in which case an immediate needs annuity can be considerd. When considering the income to pay an impaired life annuity the insurance company should use a combination of mortality tables and underwriting guides developed from the mortality experience of impaired lives. When underwriting an impaired health annuity, some life companies may use the normal mortality tables and enhance the rates by assuming the annuitant is several years older than their current age, such as aged 70 rather than 65, thereby offering a higher income. However, this is not a satisfactory solution and some companies use the Anderton Mortality Tables that base the rates not only on the ageing process but also how the annuitant's life expectancy is going to be affected by the impairment. Mortality and life expectancy is of course far from being an exact science and this is why the Anderton Mortality Tables can prove to be such a useful guide in this respect and a far more trustworthy barometer of expected mortality. The enhanced annuity takes into account the details within these tables to give a more reasonably considered result that is better for all concerned. This is a difficult subject to discuss and one that can be upsetting but it is a fact that you need the right facts and information to plan for the future, whatever the circumstances. How much income can you receive? The enhancements offered by providers depends on whether the medical conditions are lifestyle or impaired and the expected reduction in life expectancy. You could receive 47% more if you have diabetes, high blood pressure and cholesterol than the lowest standard rates, similar to many existing provider offers. The following chart is based on a person aged 65 with a pension fund of £50,000 purchasing an impaired annuity on a single life, level, no guaranteed period payable monthly in advance. The lowest standard annuity would be £2,561 pa and this is similar to many existing providers offering. Tthe highest standard is the best open market option quote, in this example offering 17.4% more. Source: Sharingpensions.co.uk research for a 65 year old with a £50,000 fund on a single life, no guaranteed period and monthly gross advance basis. 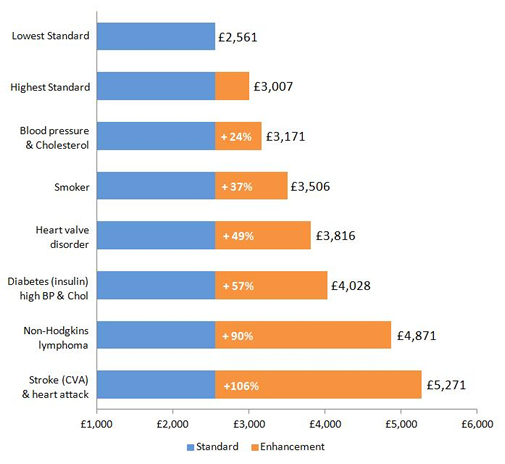 Compared to the highest open market option standard quote for people in good health, a smoker quote would offer 16.5% more and diabetes with high blood pressure and Cholesterol would be 25.2%. The difference is more significant when compared to existing provider offerings where the smoker would be 36.8% and diabetes would be 47.0%. Higher amounts can be offered for more serious and in particular combinations of conditions although the occurance of these are rare. Alternatively a purchased life annuity using a cash fund can also offer enhanced rates. For example, the family of an elderly mother of 80 years suffering from dementia may want to supplement her income. The family have realise a surplus of only £50,000 from the sale of a property and want to purchase an annuity payable in arrears, with no guarantee, without proportion or escalation and no dependents income. Annuity table - the annuity rate shown above is based on a purchase price of £50,000 and should be used as a guide only. 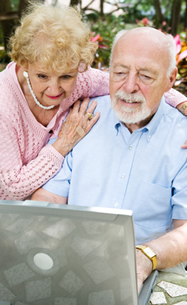 For annuities specific to your circumstances you should complete the free annuity quote. The income from a £50,000 annuity purchase for the impaired life annuity would provide a gross income 2.5 times greater than standard annuities, payable for the whole of her life. The capital could be used for a purchased life annuity or it could be used for an immediate needs annuity if the elderly mother had to be admitted to a nursing home to receive 24 hour care. An individual may have suffered from a number of medical conditions in the past or at present that could mean he or she can qualify for enhanced or impaired annuities. You can qualify for enhancements if you take prescribed medication for common conditions like high blood pressure or high Cholesterol. Your blood pressure reading can also improve the rate if this is not normal. Others common conditions is being overweight with a BMI index of 34 or more as well as different categories of smokers such as regular smokers of manufactured cigarettes, numbering less than 10 per day, 10 or more per day or those that have stopped in the last 6 months. This list is not exhaustive and when making an application for enhanced or impaired annuities it is important to state all medical conditions in order for the pension income to reflect the expected reduction in the annuitants life expectancy. Where the annuitant suffers from ill health and is applying for enhanced or impaired life pension annuities, it is common practice for the insurance company to request a General Practitioners Report (GPR). They do this to ensure that the details given in the application form are correct before paying the annuitant an income. When people are younger and applying for life assurance the underwriters could find reason in the GPR to load the premium (increase) if they feel that your medical condition creates a higher risk, and this works against the individual. However, with enhanced or impaired annuities the worse the medical conditions the higher will be the income paid to an annuitant. Where the individual is uncertain of the details of a medical condition because it occurred a long time ago, a GPR can clarify to the underwriters its severity. Sharingpensions.co.uk was created by its founder Colin Thorburn in 2001 to provide a free pensions and annuity resource to hundreds of thousands of people at retirement making their decision making easier and to select the best options.